From Rhodes to Samos, this yacht charter itinerary cruising through the Greek Dodecanese Islands is cruise through a lovely group of islands; each with its own unique feel. From Rhodes, once a hub for medieval crusaders, to nearby Symi, quiet and beautiful, to Kalymnos, where locals once free dived for sponges in the depths of the sea, to Patmos, said to be where John the Apostle wrote the Book of Revelations, and where there is a church for every day of the year, and finally to Samos, home of Pythagoras, discover each island for yourself on a yacht charter through the Greek Dodecanese Islands. Day 1 Join your yacht in Rhodes, with an east coast of endless sandy beaches and sunshine 300 days a year, Rhodes is the most popular of the Dodecanese. 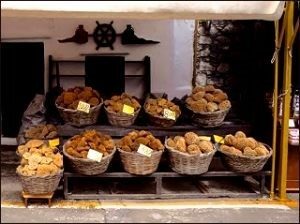 The incredibly well preserved old town of Rhodes is the largest inhabited medieval town in Europe. 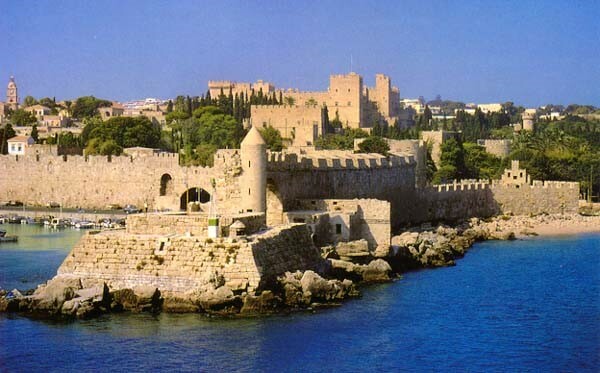 Behind imposing walls, it is the fortified nucleus of Rhodes City. The tranquil, twisting alleyways in the old town are a web of Byzantine, Turkish and Latin architecture. Faliraki Beach is the island’s premier resort; the beach at Kalithea Thermi is the site of an abandoned Italian spa. If you are looking for quiet shores cruise over to Stegna Beach or the sandy cove of Agathi. Overnight. Day 2 A lovely, mountainous island, Symi (or Simi) was reputed to be the birthplace of the Three Graces. While its interior is punctuated with small valleys, its coastline alternates between being steep and rocky or sandy and indented with little coves. 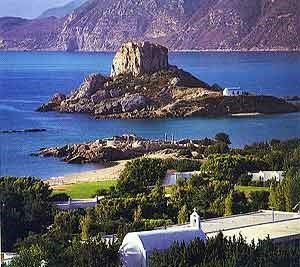 One of the island’s most famous landmarks is the monastery of the Archangel Michael Panormitis on the southwest coast. It was built in the 18th century, and contains marvelous frescoes and a carved iconostasis. This Ministry claims that all waters of the world pass through their bay at some point. If you would like to reach them, simply place a message in a bottle and at some point it will reach them. Whether or not this is always true, be sure to stop in at their museum with bottle messages they have received over the centuries. If you ask, perhaps one of the priests will give you a vile of blessed waters for your journey. There is no lack of wonderful beaches on Symi. You’ll find good swimming at Yialos, Pedio, Emborios, Marathounda, Nanou as well as on the nearby islets of Agia Marina and Nimos. 23 NM from Rhodes. Day 4 After breakfast, cruise over to Nisyros, which is said to be one of the most beautiful of all Greek islands It is a strange combination of luxuriant vegetation and stark moonscapes. A dormant volcano lies at the center of the island. The charming port town of Mandraki is comprised of winding alleys and brightly colored houses. It is situated beneath the cliff top monastery, Moni Panagias Spilianis. Near the port you will find the black stoned beach of Koklaki. Set on the volcano’s ridge are the villages of Emboreios and Nikea, which both have spectacular views into the caldera. The islands best beaches are at Pali and Lies. After lunch cruise over to Kos. Overnight. Day 5 KOS Situated only 5km off the Turkish peninsula of Bodrum, is Kos, one of the most fertile islands in the Dodecanese. 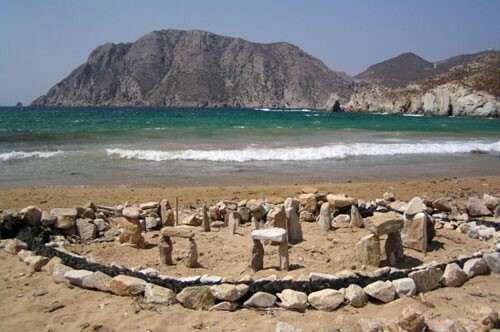 Like Rhodes, it is abundant with ancient remains and beautiful beaches. The landscape of modern Kos Town, the island’s capital and main port, is picturesque. The Castle of the Knights prevails over the port, while Hellenistic and Roman ruins are littered everywhere. There are numerous archaeological sites to visit. The Asclepion is Kos’ most important ancient site, it is located on a pine covered hill 4km southwest of Kos Town. Amongst the many sandy beaches, Agios Stefanos, sitting next to the ruins of two 5th century basilicas, is a must. At Masthari you can find a number of secluded spots on the sandy shores to rest and relax. Later that afternoon, cruise over to Leros. 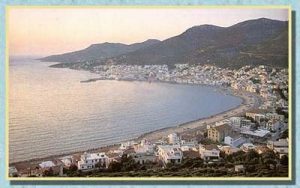 Day 6 LEROS gentle, sloping countryside is spotted with smallholdings and huge, impressive, almost-landlocked bays, resembling lakes more than open sea. 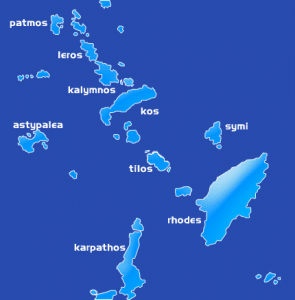 Platanos, the capital of Leros is 3km north of Lakki, the main port. This tiny picturesque village spills down the narrow hillside to the port of Agios Marina. On the east side of Platanos, a massive castle crowns the mountainside dwellings. Set on the wide Alinda Bay, are the adjoining resorts of Krithoni and Alinda, which have a lovely, long tree-shaded sand beach. At Belfoutis Bay you will find a shaded sand and pebble beach and a good taverna. A good spot for snorkeling, Xirokambos Bay is a mellow resort with a sand beach. Leave after lunch for Patmos. LEROS gentle, sloping countryside is spotted with smallholdings and huge, impressive, almost-landlocked bays, resembling lakes more than open sea. Platanos, the capital of Leros is 3km north of Lakki, the main port. This tiny picturesque village spills down the narrow hillside to the port of Agios Marina. On the east side of Platanos, a massive castle crowns the mountainside dwellings. Set on the wide Alinda Bay, are the adjoining resorts of Krithoni and Alinda, which have a lovely, long tree-shaded sand beach. Day 7 For both Orthodox and Western Christians, Patmos has long been a place of pilgrimage, for it was here that St John wrote his divinely inspired revelation, the Apocalypse. Once a favorite destination for the devout, Patmos is now just as popular with sun and sea worshippers. All boats dock at glitzy Skala, which sprawls around a large curving bay. Wrapped around the immense Monastery of St John the Theologian, the beautiful hilltop village, Hora. With its immaculate whitewashed houses and maze like alleys, it is absolutely enchanting. There are a number of sandy tree-shaded beaches around the island. Psili Ammos is the best beach and is only accessible by boat. Leave late in the afternoon for Samos. Day 8 Samos, the birthplace and home of Pythagoria, is quite the upmarket, cosmopolitan island. the little harbour of Pythagorion is lined with dozens of tavernas along the waterfront. Disembark for a domestic flight back to Athens, or cruise to Kusadasi, Turkey to disembark (1 hour) for a ferry back to Samos or a flight out of the nearby airports of Izmir or Bodrum to Istanbul.